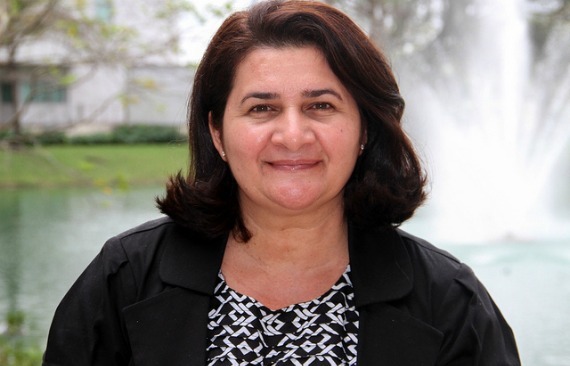 When Fostering Panther Pride’s new success coach, Ana Ramos, was required to do an internship at a community-based agency for her social work degree at FIU, she had no idea how much she’d enjoy working with foster care youth. “Because of that internship and my previous passion to work with children, I just fell in love with the foster care population, which I’ve been working with since I was in college,” said Ramos. FPP is a new program at FIU tailored for former foster care and homeless youth. As success coach, Ramos will serve as a support system, someone to assist students with navigating the university’s resources. She will also organize outreach programs on issues such as financial aid, study skills and internships as well as oversee a mentoring program for the students. Because FPP is such a new initiative, Ramos is the first success coach. She’s already met with a few students since the semester began. “My purpose during my meetings is to make my students aware of the services that they are entitled to and the services that the university and the community have for them in order to be successful academically,” she said. Prior to her position with FPP, Ramos worked as a teacher in her home country of Honduras. She also worked as a social worker at Catholic Charities and a therapist at the Family Resource Center. Fostering Panther Pride’s new success coach, Ana Ramos. Currently, Ramos is working to develop student success workshops on topics such as note-taking, test-taking, stress management and communication skills, as well as life-skills workshops on financial literacy and career readiness. She is currently investigating ways to provide book vouchers to students involved with FPP. Ramos said she hopes to provide students with a sense of security and help them fulfill any needs they may have. Students will be matched with a mentor through the program. Currently, only 13 students have been paired with a mentor. Ramos said the program is seeking additional volunteers to mentor students. Nationwide, statistics for former foster care youth indicate that only 10 percent will attend college and just 3 percent will graduate. Daniel Bolea, a second year graduate student and occupational therapy major, decided to do his part to increase those percentages. Though not involved with the FPP program, Bolea and three other students conducted a project for their master’s thesis to bring high school students in foster care to the university for a tour. Bolea explained that his group wanted to give these students a positive outlook on college. In addition to the tour, Bolea teaches a course called “Independent Living Skills” for foster care youth ages 14 to 17 years old. It teaches them how to perform basic tasks such as making simple meals and balancing a budget. It also helps them with their college applications. Amy Paul-Ward, Bolea’s occupational therapy professor, explained this program is geared toward finding better ways to engage the foster care population and prepare them to be successful adults. “One of the things that we have found is that when you bring them to FIU and they look around campus and they see that everybody here looks like them, all of a sudden they realize that there are other possibilities that they may not have thought of for themselves,” said Paul-Ward. To learn more about the Fostering Panther Pride program at FIU, visit http://engagement.fiu.edu/growing-talent/fostering-panther-pride/index.html. To contact Ana Ramos, call 305-348-6106 or email her at anramos@fiu.edu.